This week, because of Fat Tuesday, a friend was asking about where to buy Polish Paczki in town. I looked around and found a bakery, but then I also found a recipe online. It seemed pretty easy to make, so I decided to use it for my cooking around the world class with little Miss I. Here is a photo of our result and the recipe too, followed by a Polish folk story of the Dragon of Wawel. Enjoy! 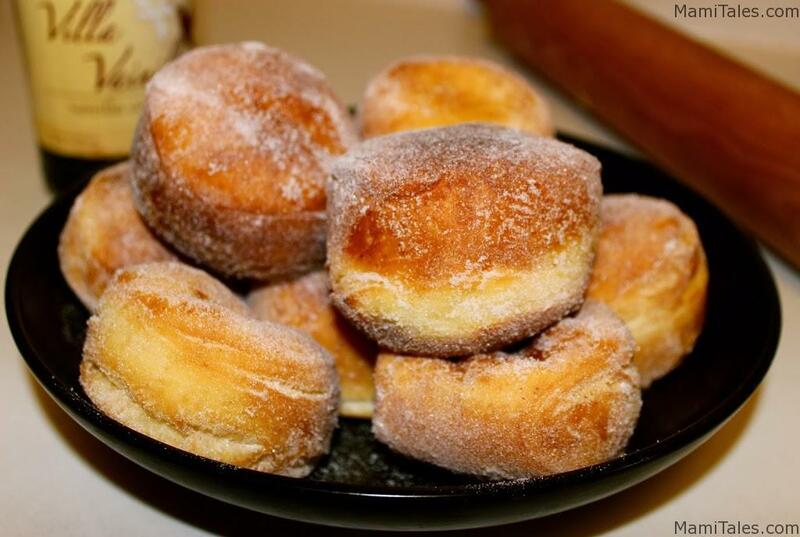 Polish doughnuts to celebrate Fat Tuesday. Whisk together the 1 1/2 cups flour, salt, and yeast in a large bowl. In a standup mixer with the whisk attachment, beat in medium speed the warmed milk followed by the 3 tablespoons canola oil, egg yolks, sugar, vanilla, and brandy. Change the mixer's attachment for a dough hood and add the flour mixture 1/2 cup at the time until all ingredients are incorporated. Stir in enough extra flour (up to 1/4 cup) until the dough holds together. Turn the speed of the mixer up, to the suggested speed for kneading. Lightly oil a bowl and transfer the dough. Cover with plastic wrap and let it rest for 10 minutes. Line a large baking sheet with a silpat mat or parchment paper. Once the 10 minutes are up, turn the dough back out onto a floured surface and roll it into a 1/2" thick disk. Cut out circles using a 2 1/2" round cutter dipped in flour. Re-roll the scraps and cut out the circles again. Place the cut rounds on the baking sheet and cover with a towel, letting rise at room temperature for 1 hour. Pour the canola oil into a large Dutch oven and heat the oil to 360F. Once the oil reaches temperature, use a heat resistant spatula or a shallow strainer to carefully drop the dough in, one at a time, cooking a maximum of 3 at once. Cook the doughnuts until they are a deep golden on one side, then carefully turn and cook the other side until it is the same color. Remove the dough from the oil and place on a wire rack, letting any excess oil train off while they cool. Test the first dough round to make sure the inside is completely cooked, and adjust the cooking time accordingly if not. Repeat with the remaining dough rounds. Cool and the dip the doughnuts in powdered sugar on both sides. You can also use marmalade and a pipping bag to fill the doughnuts. In a cave at the bottom of Wawel Hill there once lived a terrible fire-belching dragon. This dragon roamed around the countryside and did whatever he wanted to. He ate sheep and cattle and scared the farmers so much that they didn’t let their animals graze in the field near the Vistula River. Many brave knights had tried to kill the monster, but before they could get close enough to him, he blew fire on them and they were burned to death. The king wanted this dragon destroyed. He invited knights and noblemen to come and slay the dragon, promising that whichever one killed the dragon could marry his beautiful daughter and become king when he died. Many tried to slay the dragon so that they could marry the princess, but the dragon killed them. The people became even more frightened; they were afraid to leave their homes and the country became poorer. One day, a young, handsome but poor shoemaker’s apprentice named Krak asked the king if he could try to slay the dragon. The king said he could try, but noted that he had no armor, no horse and no sword. The apprentice had only his shoemaker tools and a plan. He didn’t need armor, a horse, or a sword. Krak bought a dead sheep from the butcher and some sulfur (a powder that is used in making matches) from a miner. Then he cut the sheep open with his sharp shoemaker’s knife, stuffed it with the powdered sulfur and then sewed the sheep up with the shoemaker’s thread. He put the sheep by the dragon’s cave and waited behind a rock for the dragon to come out. After a while, the greedy dragon came out from his cave. He saw the dead animal and greedily ate it. The sulfur caught fire, like a match, and the dragon felt his stomach burning. He ran to the river to quench the fire in his stomach, but drank so much water that he filled up like a balloon. He kneeled down and was very sick. Krak came out from behind the rock, and began to throw stones at the dragon. The monster tried to blow fire at him but because of all the water he drank, all that came out from his mouth was steam. The dragon kept trying to breathe fire, but because he was so swollen, he exploded and died. At last the people were free of him. Krak and the princess married. After her father, the King, died, Krak became King, as promised. He built a castle on top of Wawel Hill and for hundreds of years it was where the Kings of Poland lived. Around the hill, the people built a city which they named Krakow, after their new king.